“The Vanishing” has a clear answer to the rhetorical question once asked by “The Texas Chain Saw Massacre” (“Who will survive and what will be left of them?”) Well, no one, and very little. Such goes the true story of the Flannan Isle Mystery, about three lighthouse keepers who disappeared from a Scottish isle in 1900. Gerard Butler produced the movie and plays one of the men in question, exercising emotional muscles he does not get to in his larger, louder projects. But even with its all-around noble dramatic intent, particularly from Butler, the film struggles to leave a mark. Joining Butler’s burly family man James is Peter Mullan, who plays the privately broken grandfatherly leader Thomas, and Connor Swindells’ young and naive Donald. Five minutes into the movie, the three are on the isle, with Nyholm’s editing having a workman-like idea of its own while capturing the mundane goings-on of their duties, setting the stage for … something. The question within the film’s title and its opening text get knotted with odd plot points from Joe Bone and Celyn Jones’ script: a dead flock of seagulls, an ominous shot at night from on the water, as if a fourth point-of-view. As "The Vanishing" goes on, the film’s inklings of horror prove to make for a strange but too slow set of events. In time, this film from director Kristoffer Nyholm ponders aloud whether the three men were consumed by forces more immediate, and if done right, more thrilling than eight-eyed sea monsters or alien kidnappers. It turns the true story into a nightmare, with greed begetting death and death begetting madness. First it’s a random dead body, a trunk that’s revealed to have gold in it, and then two more men appear, inquiring with villainous scowls about what happened to both. 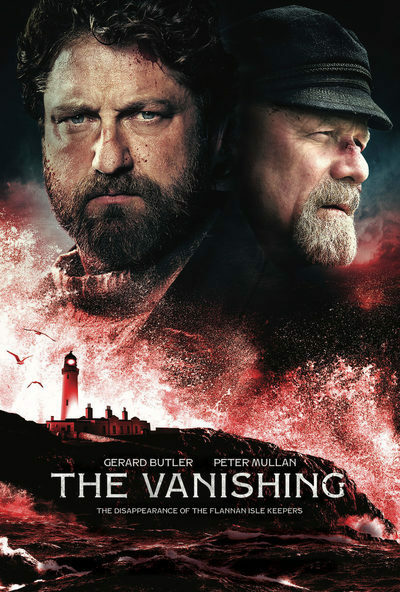 As everyone fights for what they want in such an isolated place, “The Vanishing” pummels its characters and their spirits. And as the film is as concerned with brutality as it is consequence, all of them become haunted by their capacity to kill. Nyholm, who recently worked on series like FX’s “Taboo” and BBC’s “The Killing,” has a hit-and-miss visceral approach to this bare bones tale, using handheld cameras and performance-soaking close-ups during its many moments of the men speaking in hushed tones, as if they're scared the rest of the world might hear them. A surprising intimacy arises from the violence in particular: the men often get face to face before fighting, a type of bonding moment, even if one intends to kill the other. But the story's drab atmosphere, and its thorough desperation for austerity, leads to a lack of texture, despite the world's clear frigidness, and the wrinkles that have been cut into Mullan’s forehead. Add a score by Benjamin Wallfisch, which can be obtrusive at some points and tonally misleading in others, and the movie starts to run bland, in spite of its stoicism. In the light of such machismo, the three lead performances do provide a sense that the movie is most capable as a rumination on death. Mullan, his voice like a rock avalanche, has select moments in which he monologues to the unseen ghosts of his loved ones, in moments that struggle to achieve the grandiose pain they’re clearly meant to. But notably less intrigue is created by Swindell’s Donald, who becomes a type of surrogate to the saga, showing an innocence that is lost. For the first half of the film, Butler is the muscle of the group, in the unusual spot of the background and therefore making him a particular curiosity. That all changes when his character James does something unspeakable, which becomes his express ticket for the movie’s flat path to hysteria. Butler aims to capture the horror of grief, but his stunned fragility and later monstrous nature runs matter-of-fact, not nuanced. His efforts end up capturing the spirit of the film, that of being hollow and so self-serious, mistaking rawness for revelation.